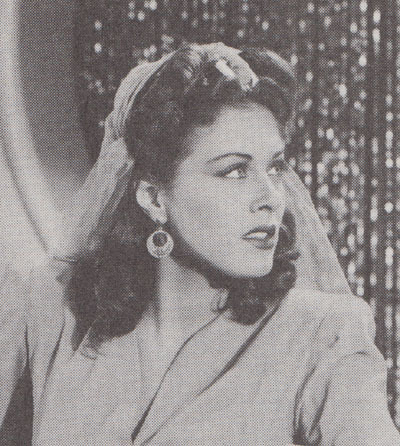 Above: Ramsay Ames in the 1944 Universal feature Ali Baba and the Forty Thieves. One of the better-remembered B-film actresses of the 1940s, Ramsay Ames possessed a dark and sinuous beauty and an upper-crust New York accent that usually caused her to be typecast as either glamorously exotic or haughtily selfish characters. However, she did manage to break out of this mold towards the end of her Hollywood career, when she portrayed the heroine in two 1947 serials. In both outings, she received meatier-than-average leading-lady roles, and did them full justice–shedding her usual aura of sultry and aloof sophistication to play wholesome, courageous, and cheerful heroines just as believably (and appealingly) as a more typical chapterplay actress could have. Ramsay Ames was born Rita Ramsay Phillips in New York City; both her father (an accountant) and mother were immigrants from England–and were apparently fairly well-off, since they were able to send their daughter to the private Edgewood Park School in Briarcliff, and to the Walter Hillhouse School of Dance. She started modeling for the Powers Agency when she was fifteen, appeared in the Eastman Kodak fashion show at the 1939 World’s Fair, and then went into show business, dancing and singing in rhumba bands on the New York and Florida nightclub circuits during the early 1940s. She made her screen debut in 1943, playing a supporting role (an antagonistic actress) in the Columbia comedy Two Senoritas from Chicago; later that year, she signed a contract with Universal Pictures, and would stay there through most of 1944. Although she received a good deal of press promotion and became a popular wartime pinup during her stay at Universal, she only received one real starring role there–the part (originally slated for another actress) of the doomed Egyptian heroine in The Mummy’s Ghost (1944). Almost all of her other Universal assignments were unsympathetic supporting parts in B-films (the “Inner Sanctum” mystery Calling Dr. Death, the Leon Errol comedy Hat Check Honey) or bit parts in A-features (Ladies Courageous, Follow the Boys); she did receive a well-publicized supporting role in Universal’s big-budgeted Arabian Nights film Ali Baba and the Forty Thieves–but was again cast as an unsympathetic character (the heroine’s treacherous servant). According to several Hollywood news items, Ames left Universal in 1944 to sign a new contract with RKO; however, she never actually appeared in a film for the latter studio. By the fall of 1944, she was playing a secondary part (another overbearing actress) in the Monogram B-musical B-musical A Wave, a WAC, and a Marine, and by January 1945 she had signed a contract with Warner Brothers. Ames only received a handful of glorified extra assignments at Warners, however, and returned to B-movies in 1946 and 1947–playing tempestuous Latin heroines in a pair of Cisco Kid B-westerns for Monogram, taking a rare conventional leading-lady part in the Monogram crime film Below the Deadline, and portraying the murder victim in PRC’s Calling Philo Vance; she also played a small role in the prestigious MGM A-feature Green Dolphin Street. 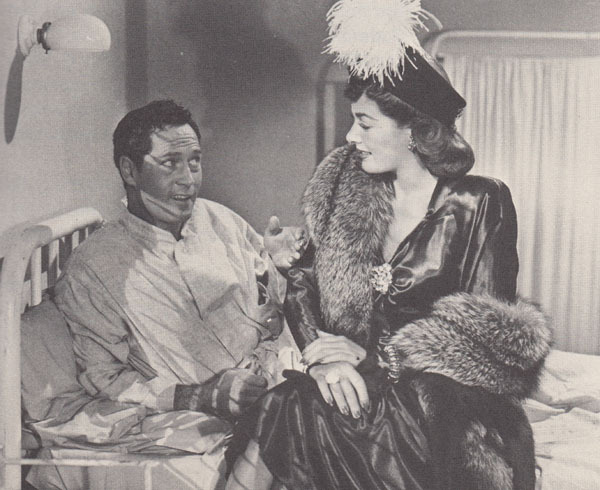 After this string of features, Ramsay landed the heroine’s role in The Vigilante (1947), one of producer Sam Katzman’s better 1940s Columbia serials. 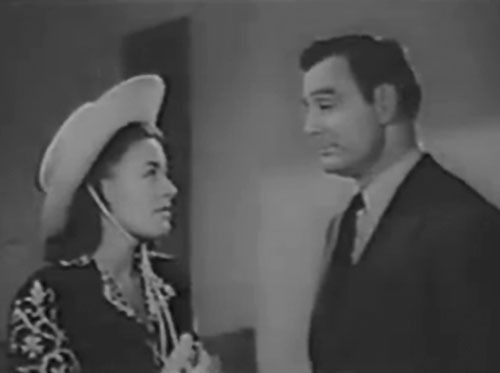 Ralph Byrd played this chapterplay’s comics-derived title character–Greg Saunders, a Western movie star who doubled as a masked crimefighter–while Ames was cast as rodeo queen Betty Winslow. Both Greg and Betty became the targets of a gang of horse-stealing crooks after receiving “Arabanian” steeds as gifts from visiting potentate Prince Amil (Robert Barron); their attempts to thwart these thefts and find out the motive behind them formed the basis of The Vigilante’s plot. Ames did an excellent job in her Vigilante role, giving her character all the poised confidence one would expect of a supposed female celebrity, but at the same time conveying plenty of warmth and good-humor; her occasionally wry but always affable bantering with Byrd’s Saunders (who, in Bruce Wayne fashion, affected a casually flippant demeanor in order to hide his secret identity) was particularly enjoyable. Although she’d only received her first real riding instruction only a year before (while making the aforementioned Cisco Kid movies), her dancer’s lissomness gave her a gracefully athletic air appropriate to her rodeo-rider character, and helped her to carry off the serial’s many equestrian scenes convincingly; she also got a chance to make use of her early show-biz experience in one chapter, in which she did a nice song number in a nightclub. Above: Ramsay Ames and Ralph Byrd in The Vigilante (Columbia, 1947). 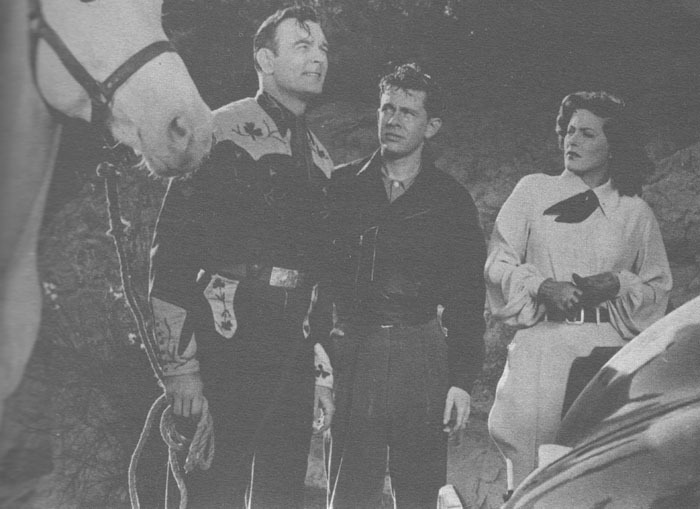 Above: Ralph Byrd (holding the horse’s bridle), Greg Offerman Jr., and Ramsay Ames get their bearings after a horse-trailer crash in The Vigilante. Ramsay next ventured over to Republic Pictures, where she figured prominently in the first two episodes of the 1947 serial The Black Widow, playing what amounted to a dual role. 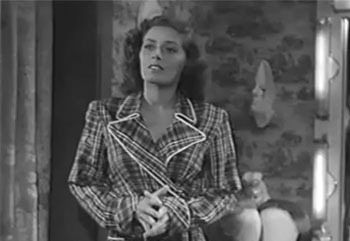 Her character, a secretary named Ruth Dayton, was kidnapped by the henchmen of female spy Sombra (Carol Forman) in Chapter One, and then disappeared from the serial (presumably killed off-camera, though her fate was never actually stated) after Sombra had a chance to study her voice; Sombra then used a rubber mask to impersonate Ruth later in Chapter One and again in Chapter Two, as part of a plan to steal atomic secrets from the secretary’s scientist employer (Sam Flint). 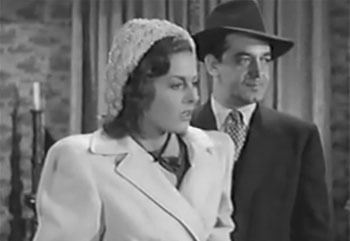 Ames had very little screen time as Ruth Dayton, but did receive several good scenes as the disguised Sombra; the part gave her the chance to act both feignedly innocent and smugly sinister. Above: Ramsay Ames’ Ruth Dayton (guarded by henchman Anthony Warde) meets Ramsay Ames’ Sombra in The Black Widow (Republic, 1947). 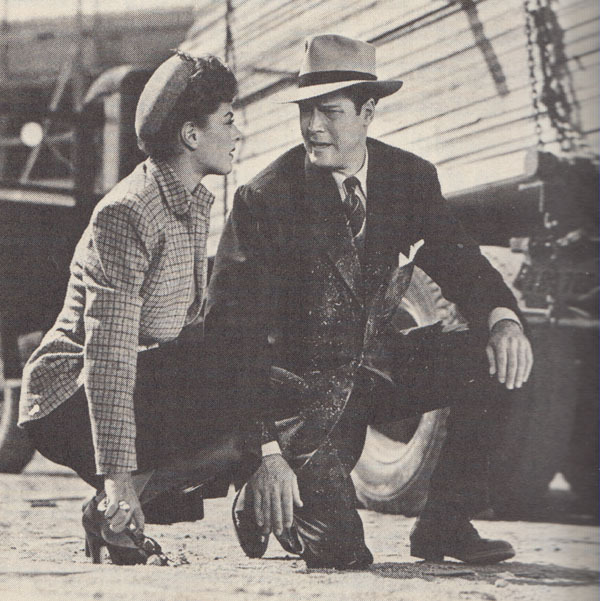 G-Men Never Forget (Republic, 1947), Ames’ third and final serial (and one of Republic’s best post-war chapterplays), returned her to the heroine slot as policewoman Frances Blake, a detective sergeant assigned to assist FBI agent Ted O’Hara (Clayton Moore) in his hunt for ruthless racketeer Vic Murkland (Roy Barcroft). The first episode of this serial, in which O’Hara went undercover as a criminal and Frances posed as his flashily-dressed “wife,” allowed Ames to cut loose in entertainingly flamboyant fashion, playing the fake gun-moll character’s toughness and slinkiness to the hilt. Her performance in the balance of the serial was more restrained, but similarly strong; dressed and coiffed in almost severe style, she projected calm intelligence and unflappable professionalism as she seconded the hero in investigations and shootouts–during which she plugged an unusually high number of heavies. She also established a very convincing rapport with Moore (whose character affectionately dubbed her “Sarge”)–reacting with cheerful bemusement to his more puzzling feats of scientific crime detection, and registering both respectful trust in his abilities and quiet concern for his safety when they were facing danger together. Above: A disguised Ramsay Ames visits an undercover Clayton Moore in the prison hospital in G-Men Never Forget (Republic, 1947). Above: Ramsay Ames and Clayton Moore have just finished a lumberyard gun-battle in G-Men Never Forget. Ames dropped out of Hollywood altogether after making G-Men Never Forget; she did some West Coast theatrical work during the late 1940s, and then (in 1949) moved temporarily to Brazil, where she appears to have continued her dancing career (her Brazilian visa lists her occupation as “artiste”), and where she married Carlos Guinle, the son of a wealthy Brazilian composer. By 1952, this marriage had ended, and Ramsay was back on the New York nightclub circuit; she made a short-lived return to the movie screen in 1953, playing a bit in the Fox mystery Vicki. Circa 1954 she moved to Spain, where she would make her home for the next eighteen years; during this long Spanish sojourn, she worked as a reporter for Variety, hosted a television interview program in Madrid, and made sporadic movie appearances–in multiple Spanish films, a German TV-movie, a couple of British pictures (including Carol Reed’s The Running Man), and the Spanish-filmed Hollywood production Alexander the Great. She visited America in the mid-1950s to help publicize this last film, and made another trip back there in the mid-1960s with her second husband, Broadway playwright and fellow-expatriate Dale Wasserman; however, she didn’t permanently abandon Spain for her home country until the early 1970s. She spent her remaining years out of the limelight, devoting much of her time to animal-related charities; she passed away in California in 1998. Ramsay Ames’ variegated non-Hollywood entertainment work and her connection (through The Mummy’s Ghost) to the evergreen Universal horror-film canon have combined to make her, as aforementioned, one of the more well-remembered B-film names of the 1940s. Her serials, however, are generally treated as a footnote to her career, even though they gave her some of her most extended screen showcases, and allowed her to exercise her acting muscles by playing against type–with complete success; though not exactly an obvious choice for the part of a rodeo queen or a policewoman, she handled both parts with full credibility and complete likability. 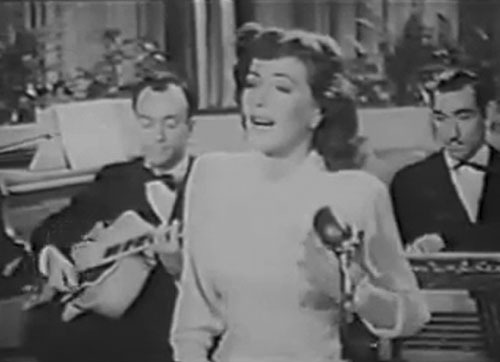 Above: Ramsay Ames sings “Somewhere Along the Trail” in The Vigilante (Columbia, 1947). Acknowledgements: The interview with Ramsay Ames in Paul Parla and Charles Mitchell’s book Screen Sirens Scream! (McFarland, 2000) was one of my main sources for this article. The 1930 federal census, Ames’ above-mentioned Brazilian visa, her 1966 marriage license, and her Social Security Death Index entry (all retrieved via the FamilySearch site) were also a big help; between them, I was able to figure out the correct year of her birth. I also made heavy use of the numerous Ames-related newspaper items available through Google News, including a publicity piece from her Universal days, a blurb referring to her Warners contract and her mysterious tenure at RKO, a Broadway column that references her marriage to Guinle, and two items that provide info about the date of her move to Spain and her Alexander the Great publicity trip. There are many similar newspaper pieces where those came from, although anyone who wants to find them should make sure to search for both “Ramsay Ames” and “Ramsey Ames;” the latter misspelling seems to prevail in most post-1940s articles. Finally, Tom Weaver’s interview with director Reginald LeBorg in Interviews with B Science Fiction and Horror Movie Makers (McFarland, 2006) told me of Ames’ unplanned casting in Mummy’s Ghost.